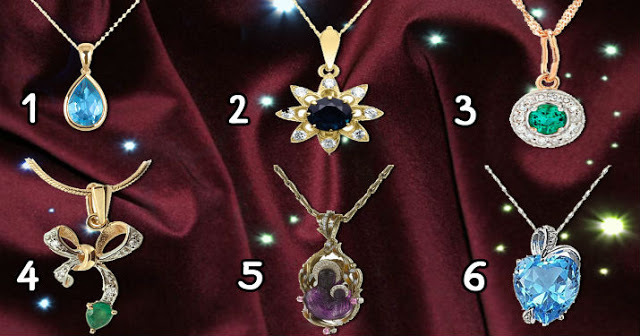 Choose The Necklace That You Like The Most, And Find Out What Kind Of Woman You Are! Every woman adores different kinds of jewelry. Ladies, today we have an interesting test for you! Choose one necklace that you liked most and find out something interesting about yourself. You are very feminine. You like beautifully dress up and make hair. First of all, you will spend money on new cosmetics or some kind of personal care. Also, for you, the family is very important, but you pay more attention to the husband, and not to the children. Our advice: Appreciate all your qualities. Try not to be passive and not to be lazy, but stay calm and graceful at the same time. You are both emotional and intelligent woman. Looking at you, we can say "The sexiest thing in a person is his soul." Every moment in your life has its meaning. You are deeper and more emotional than others. However, you can solve any problem like no one else. At the same time, you have a very original way of thinking. And also you tend to defend your principles. Our advice: use your opportunities for the benefit of yourself and people. And do not you dare to fall into pessimism! Our advice: keep a balance between excessive activity and self-knowledge. You are a real fairy! You like to do handmade work, from ordinary rags you can make a suit for a child. You have a creative approach to everything. Man wants to see next to him a woman like you if he wants to have a good family. Our advice: you need a personal space because inspiration is born in silence. Remove unnecessary actions and people from your life and devote time to yourself. You have a strong character and iron nerves. You have a very sharp mind and a quick reaction. You can be a great businesswoman. You are quite careful with people. You hate being fooled. Our advice: stop from time to time and rest. And at this time, concentrate and learn to come to harmony. Your soul asks for eternal joy and luxury. Your outfits are extravagant, and decorations shine brighter than the sun. Career for you is not in the first place. But it will be easy for you to create a successful career. Our advice: try to control your emotions a little, because you can hurt people close to you.